What if we could turn sunlight and water into fuel? That's the idea behind certain types of solar cells. Known as dye-sensitized photoelectrochemical cells, these devices use the energy contained in sunlight to split water into hydrogen and oxygen. Hydrogen itself can be used as a fuel, or it can be used to make other types of fuels. The problem? The conditions necessary to split water tend to damage the solar cell. Now, researchers have designed a more stable dye-sensitized photoelectrochemical cell. Green leafy plants readily convert sunlight into energy-dense fuels. Conventional solar cells don't. Why not? A key reaction, splitting water into oxygen and hydrogen, only occurs under harsh conditions that damage the cell's materials. Specifically, water splitting occurs under strongly oxidizing conditions (the same type of conditions that cause iron to rust). 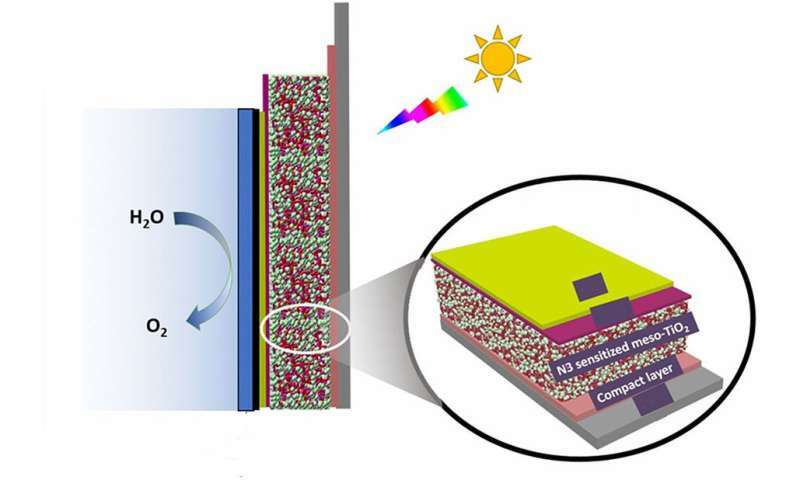 Researchers designed a dye-sensitized solar cell that can withstand these tough conditions. It exhibits good current density and is more stable than its predecessors. In the new design, the team coated the molecular components of the solid-state cell with a thin (2 nanometers) titanium dioxide layer. At first, the coating hampered the cell's performance a bit. To offset the performance loss, the team uncoupled the dye from the solid-solution interface. This change allows the use of dyes that absorb more light (working in the visible range). Also, it lets scientists optimize the pH to more efficiently split water. This research is an important step forward in solar-driven water splitting. The design takes advantage of science developed within the Department of Energy's Solar Photochemistry program and related Energy Frontier Research Centers over the past two decades.